The DiTeSt® & DiTemp® Temperature Sensing Cables are designed for distributed temperature monitoring over long distances. 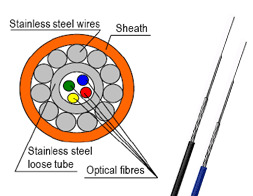 They consist of up to 4 Single or Multi Mode (SM or MM) optical fibres contained in a stainless steel loose tube, protected with stainless steel armouring wires and polyamide (PA) or fluoropolymer (PFA) sheath. These components can be differently combined in order to adapt the cable to the required performance and application. The use of appropriate optical fibre coating allows to work in different temperature ranges, the stainless steel protection provides high mechanical and additional chemical resistance while the sheath guarantees corrosion protection. Thus, the cables can be used in a wide range of applications that require distributed temperature sensing, such as temperature monitoring of concrete in massive structures, waste disposal sites, on-shore, off-shore and downhole sites in gas and oil industry, hot spots, cold spots and leakage detection of flowlines and reservoirs, fire detection in tunnels, just to name a few. The cables are fully compatible with DiTeSt® & DiTemp® systems. They are delivered on spools with maximal lengths of 5 km and with all the necessary accessories such as the gland nuts (IP65), pigtails and connectors (E-2000, FC/APC or other).